(1958) Astro Family Restaurant, Los Angeles | Remains of L.A.
-Bright orange booths and orange seats at the counter, light wood tables and counter with matching panelling on the walls, the area behind the counter has a reddish-orange smooth brick wall, and through the window to the kitchen the back wall is tiled in lovely oranges, reds, and yellows. Not many decorations on the walls except for in the back room, which seems to have many paintings of Greece. From the counter where I sat, the only pictures I could see were a big poster of a beach in Greece with the word “Dream” written in large letters. Outside on the patio were tall bushes strung with colorful christmas lights, and they shone in through the windows, making everything cozy and nice. -I got a patty melt, which was both extremely delicious and extremely messy, and a fruit cup, which was just a fruit cup. 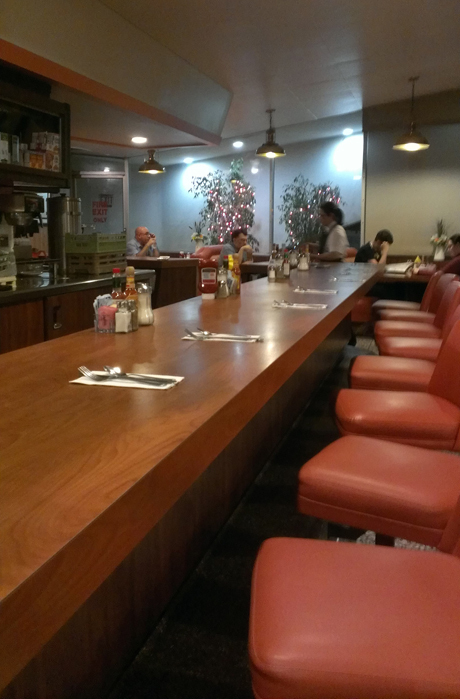 -The counter chairs were a little too far back and a little too low for me; I had to eat perched on the very edge of the seat in order to reach the counter. I’m extremely short, though. I bet great big people think they’re perfect. -By the door was one of those huge gumbail machines, with the long slide in the clear tube so you can watch the gumball fall after you put your quarter in. Next to it was a small, traditional gumball machine. I felt kind of sorry for the smaller gumball machine, until I noticed with was filled with toys, not gum. So that’s okay. -On a wall by the bathrooms was a little framed collage of pictures of a police officer named, according to the label, Randy Simmons. He was the first LAPD swat officer to be killed in the line of duty and it seems like he was a good guy, but there was no explanation of why the collage was there. Maybe he was a regular? -There was a woman sitting in a booth behind me, telling a long droning story. I wasn’t really listening, but every few sentences she’d say “so anyway,” in a much louder voice than she was using for the rest of the story. It was very startling. -The back room had lots more orange booths, and pictures all over the walls. 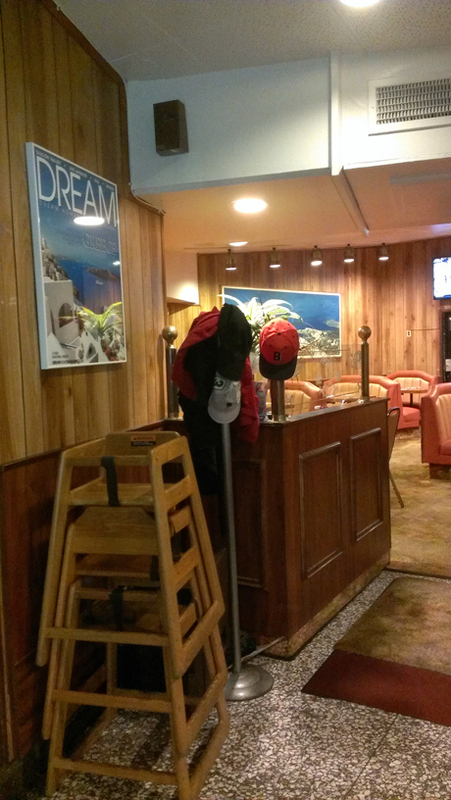 By the entrance to this room was some sort of hat/coat stand, with jackets and caps on it. They didn’t seem like they belonged to anyone in the restaurant, though. I think it may have been some sort of display, but I couldn’t really figure it out. -On the bench where people sit waiting for a table when it’s crowded was a small box of children’s books. This strikes me as an absolutely brilliant idea; I vividly remember how boring that wait was when I was a child. -in a glass case in the area behind the counter there were boxes of tea and those mini boxes of cereal, Honey Nut Cheerios and Corn Flakes and Raisin Bran. I don’t know why but small boxes of cereal always make me really happy. Back when I ate sugar, I used to order cold cereal at restaurants just so I could have the box brought to my table. There’s something oddly delightful, even magical, about them to me. I have no explanation for this. -At one point a cook poked his head out of the kitchen and said something to the manager. The manager pointed to his (own) pants and replied, sounding comically offended. Then everyone laughed a lot. I wished I could have understood them. It seems ridiculous to me that I only speak one language, yet I never do anything about it. 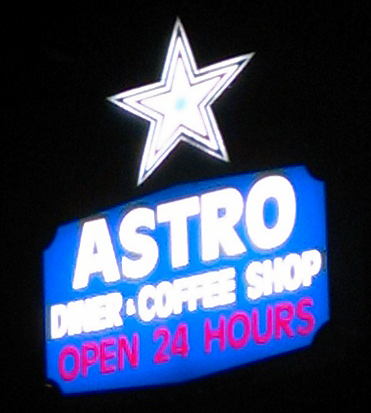 -Outside, on the patio railing facing the street, was a large banner that read, “WATCH YOUR FAVORITE SPORTS & NEWS WHILE ENJOYING YOUR MEAL AT ASTRO DINER!” I doubt this applies to me, as my favorite sports is Ninja Warrior and I only read news, but I enjoy the enthusiasm. Something about it makes me think they were so excited to have a TV they just had to run out and get a banner made. What I Read While I Ate: Homeward Bounders by Diana Wynne Jones. I’ve read it at least four or five times before; it’s easily in my top dozen favorite Diana Wynne Jones books. What Sort of Ghost I’d Expect to Find if I Believed in Ghosts Which I do Not: A group of six guys who worked together for thirty-plus years and always came here for lunch, and who would get extremely annoyed if there weren’t enough seats at the counter for them to sit together.